Bariatric Surgery Devices Market size was valued at USD 1.5 billion in 2017 and is expected to witness more than 5.8% CAGR from 2018 to 2024. Technological advances in bariatric surgery devices providing effective treatment is expected to boost market growth in the foreseeable future. Advances to reduce undesirable effects and complications post-surgery will foster business growth. For instance, in May 2016, Apollo Endosurgery launched a non-surgical incision less Orbera Coach Platform for bariatric surgery. This product offer surgeons to design treatment procedure, thus meeting specific needs of the patient. Such advancements will propel bariatric surgery devices industry growth during the projected timeframe. Increasing number of obesity cases will potentially spur market growth. As a result, number of surgeries performed in hospitals, clinics and ambulatory surgical centers is huge. For instance, according to a study published in Obesity Surgery journal, in 2013 about 486 thousand bariatric surgeries were performed across the globe. Increasing number of bariatric surgeries will thereby lead to higher demand for bariatric surgery devices over the forecast timeframe. 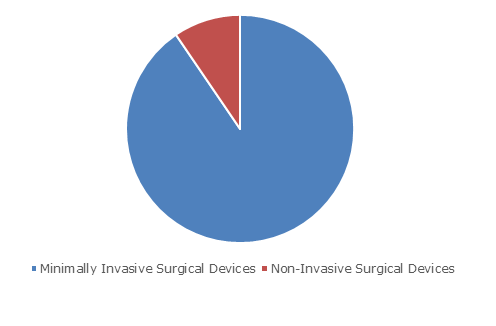 Minimally invasive surgical device segment dominated in 2017, with segmental revenue of USD 1,378.1 million owing to high adoption rate. Prevention of post operation trauma and other complications such as delayed wound healing will spur the demand for minimally invasive surgical devices. Employment of minimally invasive surgical devices helps reducing recovery time along with prevention of blood loss. These benefits will facilitate accelerating demand for minimally invasive surgical devices in forthcoming years. 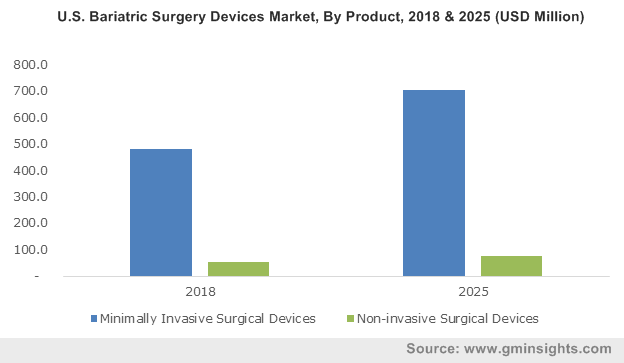 Non-invasive surgical device segment will grow at a momentous rate of 6.1% during the forecast timeframe owing to high prevalence of obesity. According to World Health Organization, more than 10% of the world population suffer from obesity. High pervasiveness of obesity will drive the need for development of advanced and innovative surgical devices for treatment of obesity. Shorter recovery time and low post-operative complication are few of the advantages offered by non-invasive surgical devices. Such factors will favour segmental growth in recent years. Sleeve gastrectomy segment held largest revenue share of 44.9% in 2017. The segmental growth is attributable to growing burden of obesity coupled with high adoption rate of sleeve gastrectomy. High adoption rate is attributable to high effectiveness and batter patient outcome. Affordability and less complications of sleeve gastrectomy will promote segmental growth in forthcoming period. Gastric bypass segment will grow with a remarkable rate of 5.8% CAGR during the forecast timeframe. High growth rate is credited to enhanced weight loss provided by gastric bypass procedure. Reduction in length of stay in healthcare facilities is major factor propelling segmental growth. Reduction in appetite will result in significant weight loss, thereby increasing patient preference towards gastric bypass procedure in the future. U.S. bariatric surgery devices market contributed to largest revenue of USD 504.8 million in North America in 2017. High disposable income and various reimbursement policies will enable patients to opt bariatric surgical procedures. Bariatric surgery is widely opted treatment procedure for obesity in U.S. due to growing influence for minimally invasive surgical procedures. This will foster regional growth in foreseeable years. Indian bariatric surgery devices market is forecasted to grow at a rapid rate of 7.2%, owing to escalating rate of obesity. According to a study published in International Journal of Community Medicine and Public Health in 2016, about 100 million people suffered from obesity in India. Increasing healthcare expenditure, R&D activities and growing per-capita income, will contribute to boost industry growth. 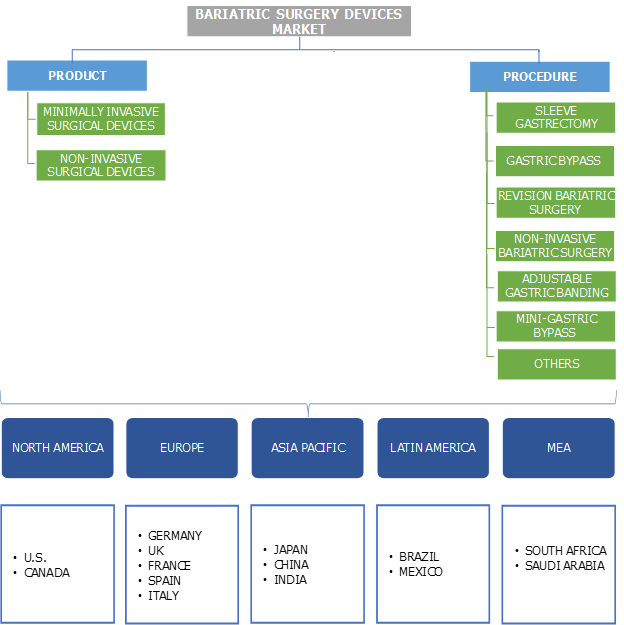 Few of the notable industry players operating in global bariatric surgery devices market are Apollo Endosurgery, B. Braun Melsungen AG, CONMED Corporation, Ethicon Inc. (Johnson & Johnson), Integra Life Sciences Holding Corporation, Intuitive Surgical, Medtronic, Olympus Corporation, Reshape Lifesciences, and W. L. Gore & Associates, Inc. These companies are opting novel product launch, mergers and acquisitions to foster business in Bariatric surgery devices industry. For instance, in December 2016, Apollo Endosurgery Inc., merged with Lpath, Inc. This move will enable the company to expand its portfolio and geographic outreach, thereby strengthening its market presence. The first procedure for inducing weight loss was performed in 1953. Numerous upgradations are done since then for improving patient outcome and reducing complications associated with use of conventional surgical devices. Various technological advancements and introduction of surgical robots for performing bariatric surgery with minimal incision are currently being used. Bariatric surgery device will witness rapid growth on account of high prevalence rate of obesity. High prevalence rate is encouraging key industry players for development of advanced and novel devices for performing bariatric surgeries. 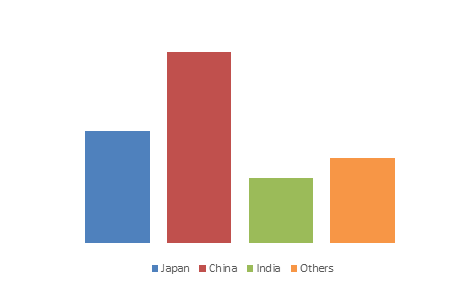 Industry is witnessing large number of new entrants that are engaged in the development of advanced bariatric surgery devices with miniaturization to generate higher revenue. With advancements in existing technologies, bariatric surgery devices industry will offer promising growth opportunities in near future.